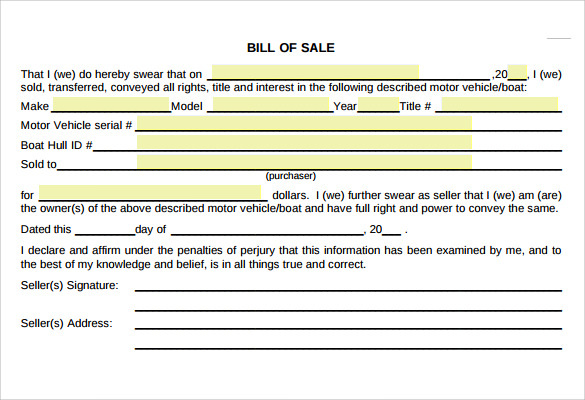 A car bill of sale is a legal document issued by the “seller” of a vehicle to the “purchaser”. It gives a detailed account of the transaction between the two parties. For the seller, the Vehicle Bill of Sale specifies the date on which the ownership of the vehicle was transferred to the purchaser, whereas for the purchaser, it provides detailed information about the vehicle. 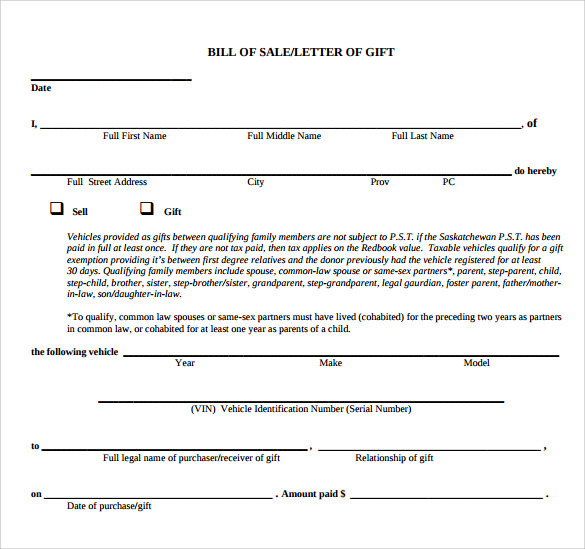 This bill of sale template of a car is maintained in a portable format that can be printed or retained as a soft copy. It comprises of sections giving details of the transaction, the seller and the buyer to be filled in and states the legal confirmation of the vehicle’s information. There is no guarantee period granted. This template accounts the sell or transfer of ownership between two individuals and their details typed in assigned spaces. The template declares the details of the car and its clearance of formal obligations It is sealed and signed with acknowledgement of a county official. 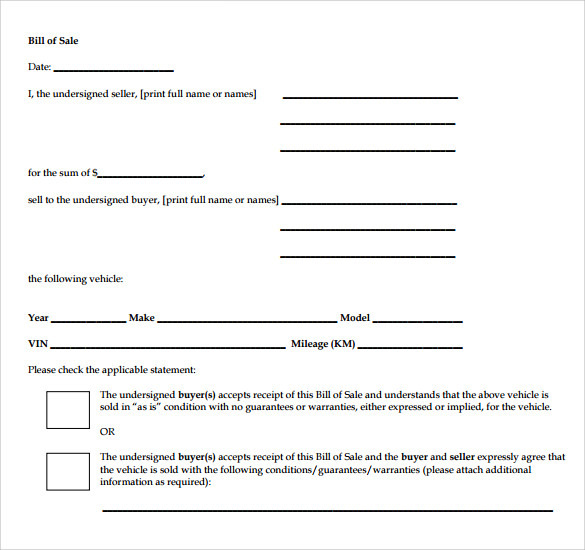 This is a printed or typed template issued over sell of a car. This includes name and address data of buyer and seller, ID number and model name of the car and date-time inputs. This template offers option of withholding details of asset kept in possession in exchange of interest. When Do You Need A Car Bill of Sale Template? 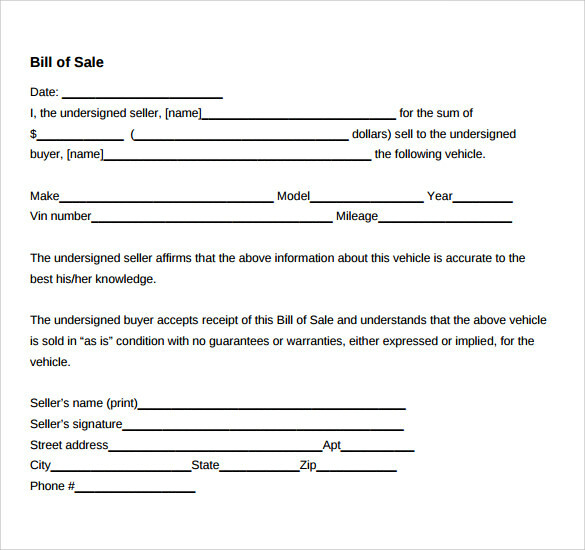 While purchasing or selling a car, you will need a car bill of sale template that will state the transaction details between you and seller/buyer. This is needed whenever you need to show a proof of this dealing and for tax purposes as well. In case of a guarantee that has been issued for the next one-year post sale, this template should be in your possession. During formal investigations of the car, this template is needed to prove that it has obtained clearance of lien, damage and other details. In case the car has been purchased with the interest covered from a security deposited to a lien holder, then this template is a hard copy proof of the lien. You can also see Motorcycle Bill of Sale Templates. This template provides benefits to both the seller and the buyer. Above it provides a legal evidence of complete transfer of ownership in exchange of an amount. For a buyer, it gives details of the seller, warranty or guarantee offered and his/her proof of ownership. For the seller the template gives a detailed information of the purchaser, shift of ownership, the legal affirmation declaring that the car has undergone all obligatory clearances and the authorized claim that the car has been sold at “as-is” condition. This template builds up a trust between both the parties and is an official record of their dealings. There are various templates available for issuing a car bill of sale according to the mode of transaction be it by selling, transfer of ownership, gift or lien. According to the type of transaction you take up, choose your template. 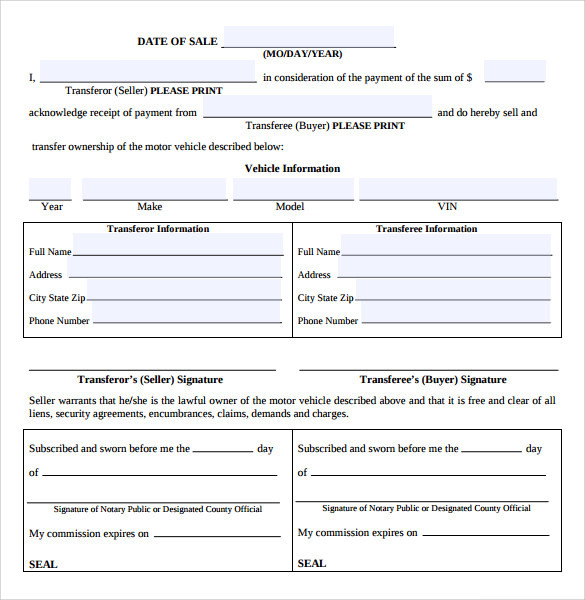 Ensure that the template includes basics of both parties of the dealing, date and time of issue of the template, amount that has been exchanged for the car, legal clearances that the seller has claimed, signature of a witness that can be a county officer or notary public, vehicle number or the registration identity number and any special mention that can vary from one deal to another. The template must be bearing signatures of the seller and the buyer. While transferring the ownership of a vehicle, a bill of sale is the easiest way to make the whole transaction legal. 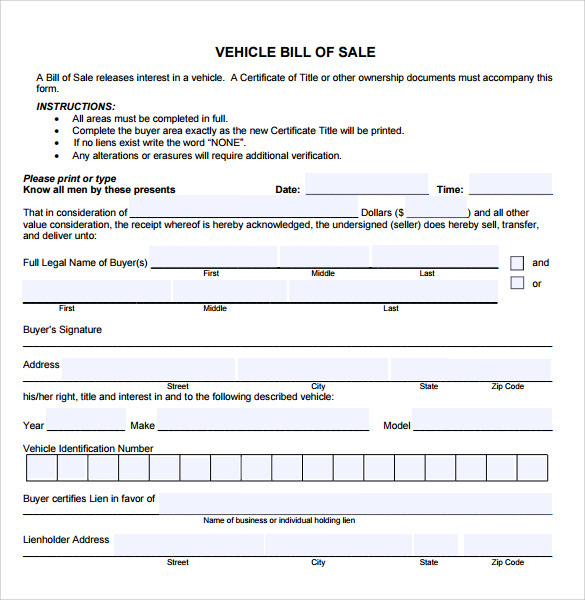 Now you can have your own Vehicle Bill of Sale ready in minutes with the help of our downloadable car bill of sale templates listed below (available in PDF, Doc, and other commonly used formats). You can also see Sample Generic Bill of Sale Templates.